Rob Cesternino and Akiva Wienerkur have lit their cream soda incense and are ready to bring you another Seinfeld Post Show Recap. This time they discussed “The Blood”, which first aired October 16, 1997 as part of season nine. The episode was written by Dan O’Keefe. 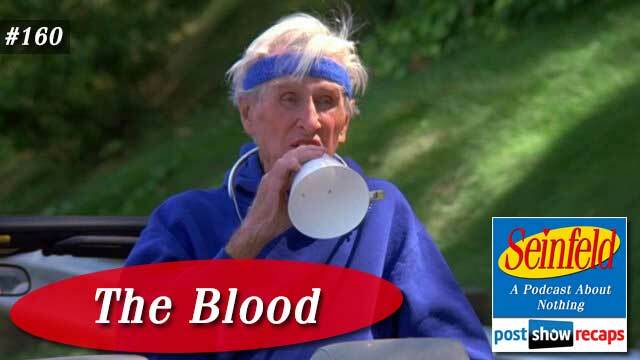 Emails – Johnny De Silveira noted that “The Blood” was Lloyd Bridges’ final TV appearance. Kaia wondered if her boyfriend is a loser for passing out when giving blood. Lindsay asked if they give blood, and also wondered if they have anyone in their life that owe them a favor. Craig wondered what things their kids have destroyed of theirs. Matt asked why Izzy Mandelbaum would even want to train Jerry after all he put him through. Caleb asked them to rank the core four in who they would let babysit their kids. Amir noted that Kramer backed down in a fight numerous times, disproving his theory for why he needs to keep the blood. Finally, Chester chimed in with an array of takes. Tune in next week as the guys will recap “The Junk Mail”. Send in your questions by emailing[email protected]. Don’t forget to subscribe to the podcast by going topostshowrecaps.com/seinfelditunes where you can rate and review the podcast. You can get a discussion going by leaving a comment on the show pages, and as always, you can follow them on Twitter @robcesternino and @keev26.